As Cheerios turn 70, I'm filled with a certain American pride that comes with being part of a culture that has pioneered mass produced cereal shapes. The Quaker Oats Company used to have an ad campaign for their puffed wheat and rice that used the phrase "the cereal shot from guns". They didn't specify "puffing" guns, but I guess their claim was, in fact, accurate after all. I wonder how many politically-overcorrect parents would forbid letting their kids have ziploc baggies full of cheerios if they knew it was "shot from guns"! Cereal violence! Zero-tolerance! What caliber would they be? Can it go to full auto? Is there a testing lab deep under ground where technicians blaze away at kevlar-wearing assistants? Are there industrial spies lurking in the Lucky Charms factories trying to abscond with highly guarded "yellow moon" pistol technology? Can you imagine how long it would take to fill all of those boxes with a semi-auto--or worse yet, a single-action--cereal gun? Just imagine all of those poor little pioneer children who had to wait for a bowl of Cheerios fired from a black-powder cereal gun. Being full-auto, do you need a class 3 license to get one? 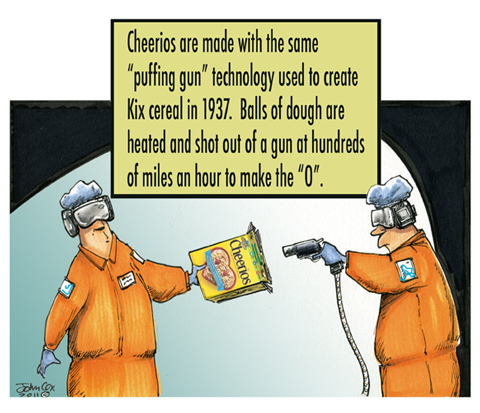 If the Cheerio is fired from the same gun as Kix, what kind of gun do they use to shoot the hole in the middle? Can you imagine how good the marksmanship of that guy has to be to hit that close to dead-center on all of those Cheerios? Yeah, I remember the Quaker Oats commercial. Could never quite balance the ideas of "Quaker" and "Guns". Even if only cereal was involved. But I would like one of those full-auto Cheerios' guns. But then, so would the two grand kids! Breakfast would definitely be a BLAST! General Mills shoots Cheerios. Quaker shoots Oh's & Cap'n Crunch. Prince Charles better be careful if ever wears that get-up he wore to the royal wedding again. You can't make an "Oh" soggy. They're as a hard as a rock. They stay crunchy in milk even longer than Cap'n Crunch. Longer than bricks, even. I'd rather be shot with a Cheerio than an Oh. i do not know much about USA's culture. so , i do not understand much about this post without some explain. This page contains a single entry from the blog posted on June 27, 2011 9:36 AM. The previous post in this blog was Illustration Friday Entry: MIDSUMMER NIGHT.